Successfully Added Wireless Baby Monitor - 3.2 Inch Display, Temperature Monitor, Dual-Way Audio, 2.4GHz Wireless, Play Songs, 5M Night Vision to your Shopping Cart. 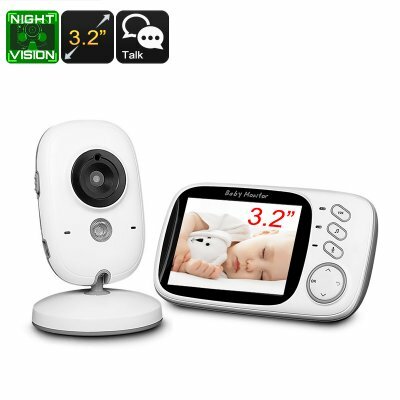 Arabic: - مراقبة الطفل - Chinese Simplified: - 婴儿监视器 - Czech: - Baby Monitor - Danish: - Babyalarm - Dutch: - Babyfoon - French: - Moniteur pour bébé - German: - Babymonitor - Hebrew: - המוניטור - Hindi: - बच्चे की निगरानी - Italian: - Baby Monitor - Japanese: - ベビー モニター - Korean: - 베이비 모니터 - Malay: - Monitor bayi - Norwegian Bokmål: - Babymonitor - Romanian: - Baby Monitor - Russian: - Радионяня - Spanish: - Monitor de bebé - Thai: - ดูแลเด็ก - Turkish: - Bebek telsizi - Vietnamese: - Baby Monitor. Only one person can talk at a time, it is half duplex technology, ( it's not like we talk over the phone) & camera do not have battery, it required to be plugged all time.